If you’ve seen the latest season of South Park (and if you haven’t, I recommend you do), you know exactly what member berries are. They’re these little bunches of grape looking guys that are nostalgia flavoured. Member Chewbacca? Oh yeah. Member the Millennium Falcon? I member. Since these guys are so adorable, and therefore extremely deadly (at least to civilization), I’ve decided to give them their very own physical form. 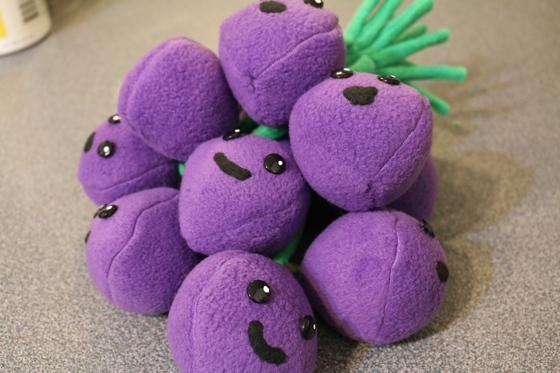 I’ve created a DIY Member Berries plush tutorial that turned out just as I hoped it would. The only caveat I’ll give is that while making one of these little fella’s isn’t too bad. Making a dozen of them certainly ups the amount of time it takes to do this project. So don’t expect to put this together in an hour or two. Each berry is made from three pieces of fabric which when you’re making a dozen of them means you’re going to be cutting and sewing thirty six pieces of purple, sewing on twenty four buttons, and a dozen mouths. Fairly simple to do, but I was at this for awhile. Can you make these for me? I have a lady at wk who loves member Berry’s. I have no time and no sewing machine. Please email me. boonesfarm08@ Verizon.net. Can’t find any one who sells them it would be great if they had a little member Berry’s voice inside. Thanks. Unfortunately the plushes I make are not feasible to sell. They take much so much time to make that I’d have to charge a ridiculous amount of money for them even if I only charge minimum wage + materials.